Rocks, gravel, tangled root masses in your soil? Sift it before filling your bags. Your bag fill will be more uniform, you won't have things sprouting out of your bags, and that growing pile of rocks & gravel that you've screened out can be used in filling your foundation trench. You might even get lucky & find hidden treasures (we have a growing collection of tiny medicine bottles, coins, toys and other oddities). Basic size is 25" x 36" and fits atop standard wheelbarrows. We use fir for the frame and galvanized mesh. 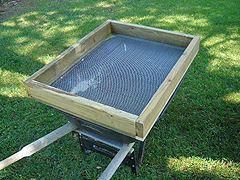 Choose 1/2" screen (for general sifting) or 1/4" screen (for fine sifting). Options include 1/2" green vinyl-coated screen (add $5.00); two coats of spar varnish (add $5.00); and our deluxe heirloom version, which consists of a hardwood frame hand-rubbed with teak oil & brass fittings (add $30.00). Each screen is made to order; allow 1-2 weeks. If you'd like a custom size or have special requests, give us a call.